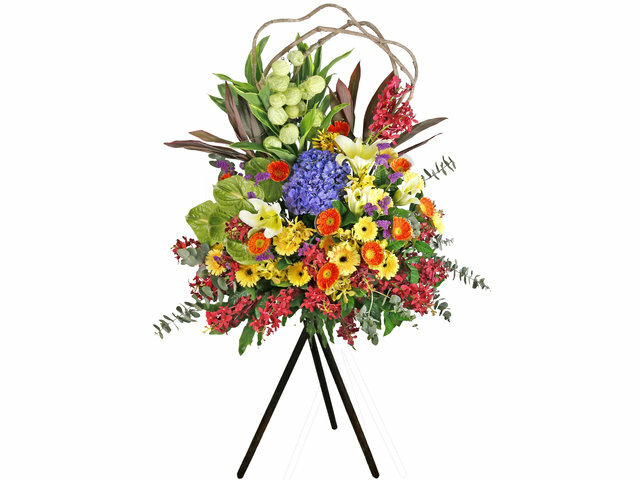 Sending the Grand Opening flower basket is a way to express congratulation to the recipient. The flowers in the flower basket have a lot of diversity, including red phalaenopsis, white orchid, oncidium, lily, sunflower, hydrangea and rose. What are the meanings behind these flowers on the flower basket? Phalaenopsis is an orchid genus and looks like a butterfly. Its Latin name Phalaenopsis is made up of the Greek phalaina and opsis and enjoys the reputation of "Queen of the orchids". Phalaenopsis has a beautiful posture and a dazzling color. It is one of the treasures of orchids. Different Phalaenopsis has different flower language. The flower language of Red Phalaenopsis is a successful future at work and lasting happiness. White phalaenopsis is a symbol of pure love and precious friendship. Oncidium is a genus of the orchid family. The origins of oncidium are Brazil; Mexico; and Bolivia. The appearance of the oncidium is like a "dancing girl", which is extremely elegant. 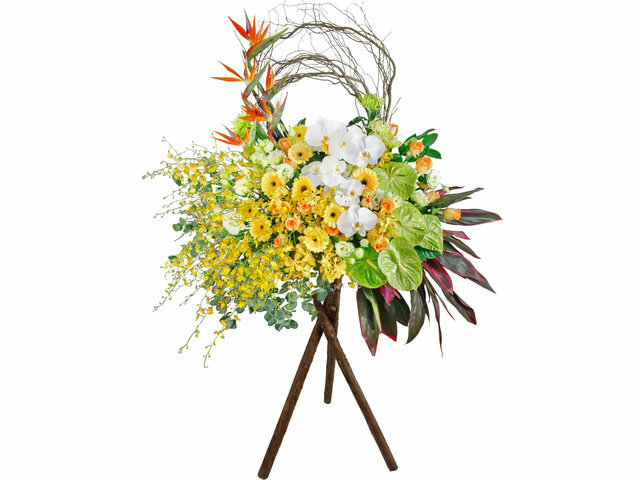 This flower arrangement is mostly used for home and offices decoration, and is also one of the top-graded flowers for making congratulatory flower baskets/stands. The flower language of oncidium is joyous and worry-free, meaning to forget about the troubles. Common varieties of lilies include Perfume lily, Tiger lily, and Taiwan lily. People in general think that lily flower symbolizes “stay in love forever” and “everything goes well”, so lilies are one of the most popular flowers among the public. Lilies’ language of flower is humility, devotion, nobility and blessings. Lily is not only very pretty when it blooms, it also has pleasant fragrant; so lilies are widely used in many occasions. 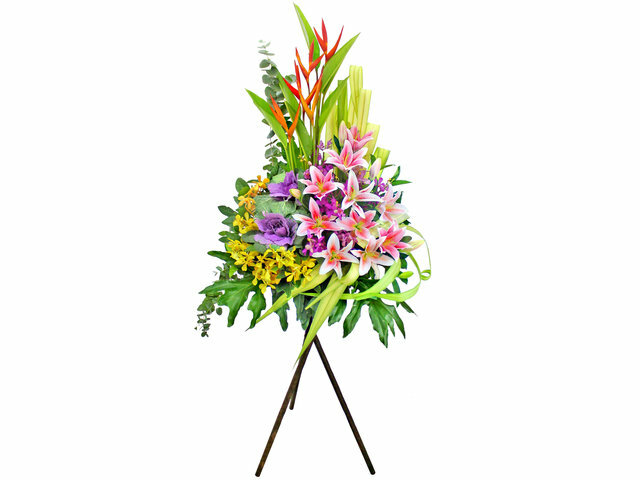 They can be made into lily bouquet and vase lily flower, or they can be used as one of the floral materials for the grand opening flower basket stands. Sunflower Gerbera Daisies has bright color and unique shape, which can mean passionate, happy forever, persevere and positive. The Gerbera Daisies/sunflowers love the sunshine when blooming; even when there’s no sunlight, sunflower gerbera will still stand up straight without the open petals until it withers. Such perseverance characteristics and its delicacy make the Sunflower Gerbera Daisies a favorable flower material for the grand opening floral gifts. As the name suggests, hydrangea is oval in shape, like the embroidered ball in ancient China. The flowering period of hydrangea is every year from May to August. The common hydrangea colors are blue, pink, purple and white. Hydrangea is one of the famous garden landscape flowers for people to appreciate. The best way to preserve hydrangea is to make it into dried flowers. At the same time, hydrangea is one of the most commonly used decorative flowers for the florists in making the preserved flower gift box. 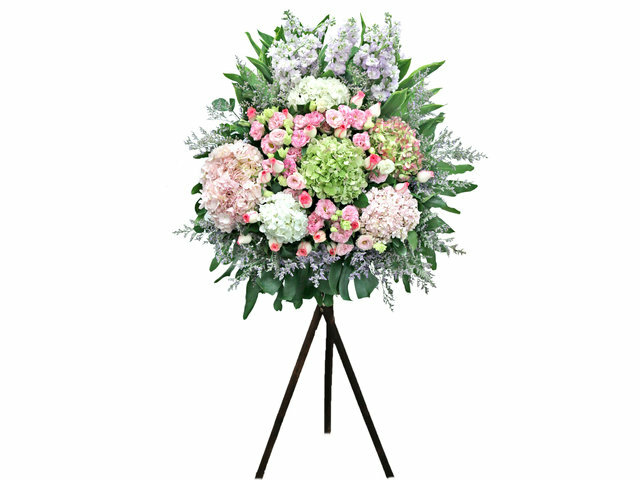 The language of hydrangea flower is hope, loyal, eternal, happy and reunion; with such beautiful meanings, hydrangeas are widely used on all sorts of flower bouquets, flower stands and flower baskets. The above five flowers are the suitable floral materials for the making grand opening flower baskets, and the good meanings behind these flowers are good complements to send your congratulations to the recipients! This is a Hong Kong GGB original 'What kind of flower is suitable for Grand Opening Ceremony? 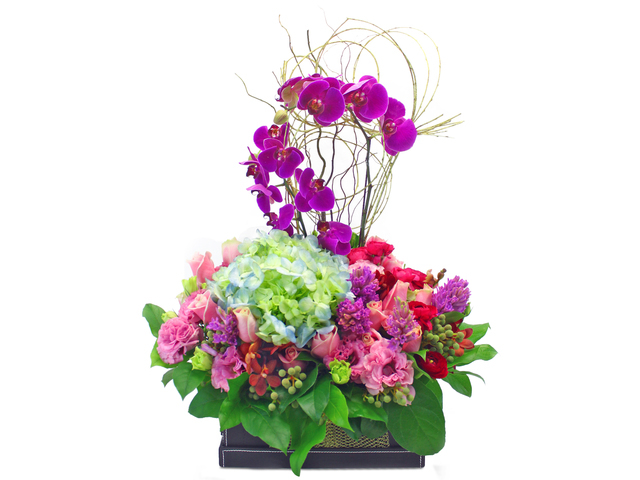 / The Meanings behind the Congratulatory Floral Stands Flower Combination' blogpost.